The frequency of these types of questions encouraged the College of Licensed Practical Nurses of Alberta (CLPNA) to create a tool to help employers and LPNs determine the parameters of safe and authorized practice for an LPN in Alberta. 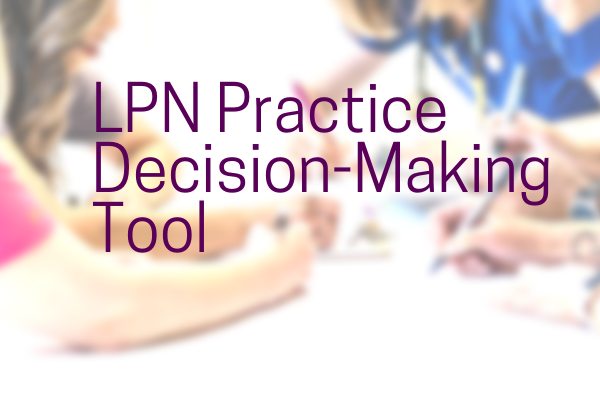 The Licensed Practical Nurse (LPN) Practice Decision-Making Tool leads the user through increasingly more specific considerations to determine whether a role or activity is appropriate. Applicable to all practice settings, it considers the individual nurse’s education, experience, role and accountability within the LPN scope of practice. Users begin at Question 1 and proceed to go through the questions in order. Answering ‘Yes’ to a question allows the user to proceed to the next question. Answering ‘No’ to even a single question means that practice may not be appropriate at this time and additional consultation with CLPNA may be required. If ‘Yes’ is selected for all six questions in the tool, then the role or activity is considered appropriate for the LPN. Need help? Users can also consult the CLPNA’s Practice and Policy documents or contact the Professional Practice Team at Ask CLPNA, practice@clpna.com, 780-484-8886 or 1-800-661-5877 (toll free in Alberta). Great idea for all professionals! Immunizing a 5 year old and under is prohibited, not within our scope of practice. This is an excellent resource, ensuring Competent Committed Care in our Practical Nursing Career!!! No spoilers! 🙂 And thank you! We have had a great response on this document.